ON THIS DATE (June 24, 2003) ... Together, Derek Lowe, and Kevin Millar, joined forces with the Hit Machine, Nomar Garciaparra, to lead the Red Sox in a good old-fashioned whupping of the lowly Detroit Tigers, 10-1, before 33,848 on an evening of balmy bliss at Fenway Park. Garciaparra chipped in by going 5 for 5 and scoring three runs just three days after he matched a club record by going 6 for 6 against the Phillies. 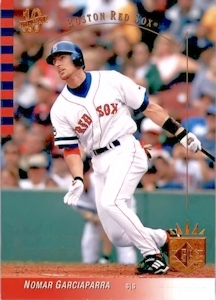 While Lowe smothered the anemic Detroit lineup, surrendering a lone run on seven hits and a pair of walks over eight innings to improve to 8-3, Millar powered the Sox by going 4 for 5 with a double and matching his career high by knocking in five runs. Facing a Detroit starter, Nate Cornejo, who has struck out only 15 batters in 86 innings this season (the worst ratio among AL starters), the Sox were primed to make contact, and they did like crazy. They doubled, it seemed, almost at will, banging out six two- base hits to increase their season total to 201, tops in the majors. Johnny Damon? He doubled to drive in two runs and extend his hitting streak to 13 games. Bill Mueller? He interrupted his .188 funk over the last 17 games with a run-scoring double. Manny Ramirez? He doubled in going 2 for 4, scoring three runs. David Ortiz? A double, sacrifice fly, and two runs. Jason Varitek? He doubled, knocked in a run, and scored one. Garciaparra set the table all night as he boosted his average this month to .430 and his average in the Fens this year to .417. Yes, he feels more comfortable than he did last year when he was still recovering from surgery on his right wrist in 2001. The Red Sox shortstop has 11 hits in two games four days apart. Garciaparra was singling five times through seven innings before being lifted for a pinch runner, Freddy Sanchez. On April 26, following an 0-for-19 slump that was the longest of his career, Garciaparra was batting .248. Out of sight of the media, he spent hours studying video and tinkering with his swing. Since that day, he is batting .389 (84 for 216). He is batting .430 overall for the month of June, and .417 for the season in Fenway Park.